Seagull Vista is a beautiful new home in our program. The owners have spared no expense in creating a wonderful experience for you the guest. See here the large parking area either side of the path as you first pull up to the house. 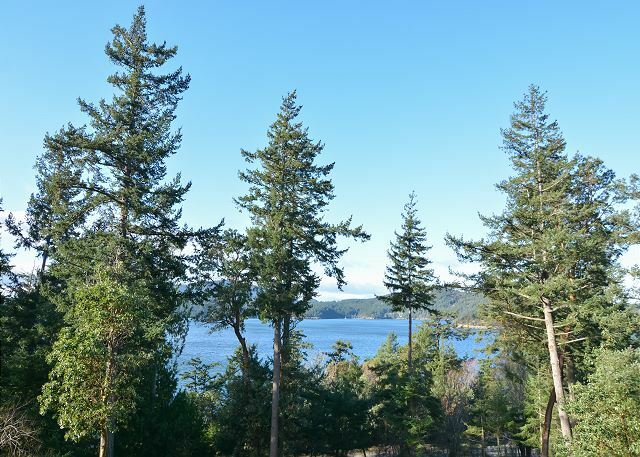 The home is in a gorgeous location on a hillside that overlooks East Sound. An expansive deck extends the full length of the house and offers plenty of space for spending time outside. Welcome inside! Notice the beautiful finishes and furnishings. Start a cozy wood burning fire to enhance a good book or conversation. Here is the living room - what a great place to stay and relax a while. 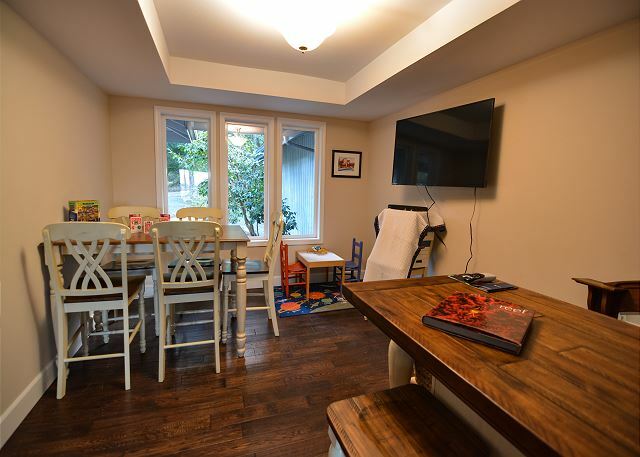 This game area is located right off the entrance to the home and is a great place for the younger members of your group to spend time and enjoy themselves. 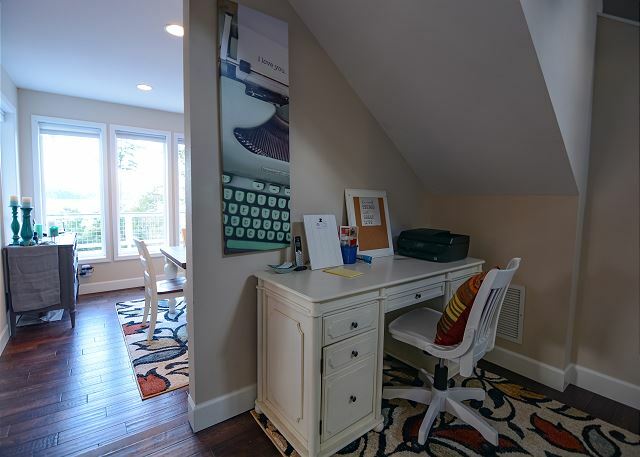 If you need a space to get some work done while away this desk and chair might have your name on it! Walk further into the house and you'll find this beautiful kitchen featuring wood cabinetry, stainless steel appliances, circular breakfast table, and walk out glass doors onto that same huge deck in front of the house! Enjoy the view while cooking! Plenty of counter space for two or more cooks! This dining table features some of the best views. With seating for eight it is the setting for memories. What amazing views to wake up to from the master bedroom. The master bedroom has a queen size bed and TV. A double vanity sink and jetted tub in the master bathroom. Both the tiled walk in shower and jetted tub can be seen side by side in this photograph. 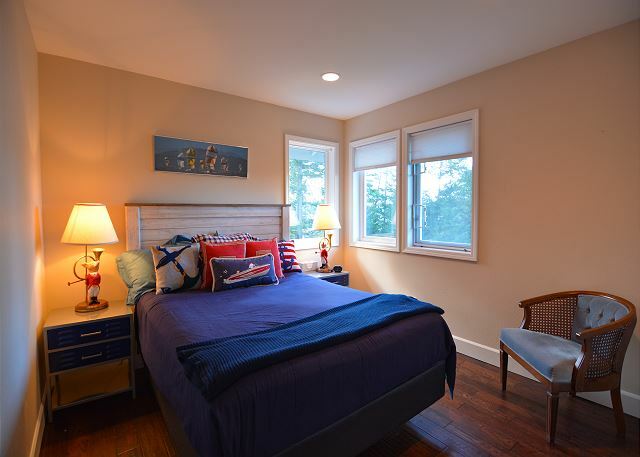 The ground floor bedroom with queen size bed and a beautiful garden setting. The upstairs hall way showing the rooms with the two single beds on the left and a guest bedroom with a queen size bed. A queen size bed and chair. Two single beds with over sized TV! The bathroom designated for the upstairs guest rooms. One last view from the deck! Thanks for checking out Seagull Vista on Orcas Island! 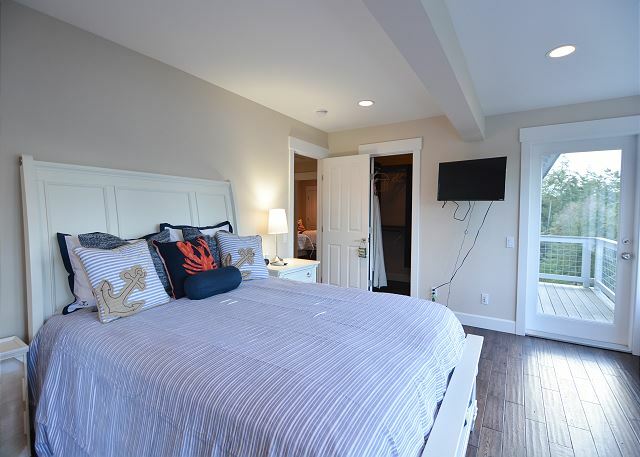 Turning onto the quiet Thistle Lane you will see your vacation home perched up on the hillside. 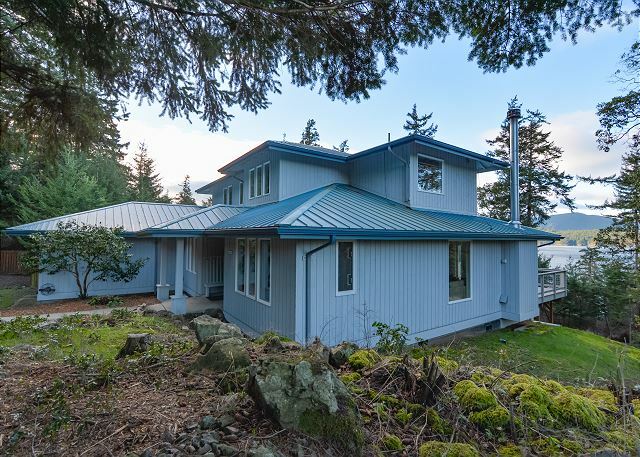 A bright blue metal roof and spacious deck give a glimpse at the home's high quality build and spacious layout. The covered entry way has a bench for taking shoes on and off as you come and go from the home. Looking to your right you will see the main floor bedroom which is great for a couple that has a hard time going up and down stairs. To your left is a hang out area complete with board games, bar, and counter height table and stools. Moving into the kitchen area, stainless steel appliances are spaced between granite counter tops that provide ample space for multiple cooks. The dining room is positioned to maximize your view of the water while you enjoy dinner. After dinner your group can move to the large sectional couch in the living room to converse or watch a movie. 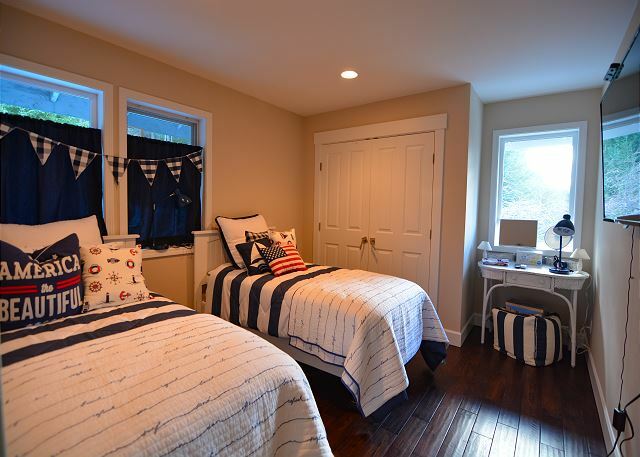 There are three additional bedrooms upstairs, two with a queen size bed and the other with two single beds. The master bathroom features a jetted tub and separate walk in tile shower. The outside deck area is spacious with great views of the East Sound water way. The deck leads down to a side yard that is completely fenced in and ready for your dog to explore and enjoy the vacation as well. This was a beautiful home, full appointed kitchen, comfy beds, great views and feel to the space, and the best location on the island! I would highly recommend and I’d also come back and stay!! This was a lovely experience. Family of 5 adults had plenty of room, house very well equipped for hanging out, being together or alone, cooking and eating, enjoying the views, and traveling to interesting spots, all fairly close by car. The house is beautifully appointed--a pleasure all in all. Rental agents were very helpful when a snag in our timing came up--all ended well, and the owners were willing to be flexible if needed. House very clean and organized. Beautiful view. This beautiful home was perfect for our family of 8. We especially loved the huge deck where we could watch the deer graze in the lower yard. The whole house is decorated so tastefully and was a wonderful place to return to after our Orcas Island activities.